It's the last day of October 2015 and it's time to say 'Goodbye to October 2015'. The weather during this October was not great. Plenty of cloudy and rainy days, in my opinion more than usual for an average October. Sure there were some sunny days but there was also plenty of rain and especially towards the end of this month it looked like the rainy season had already started. I would rate this October as slightly below par! Other news around Koh Samui has the tragic dead of a 20 year old German girl due to a box jelly fish incident at Lamai beach earlier this month in the headlights. This triggered a lot of initiatives, through official channels and private efforts, like my presentations on awareness and prevention about box jelly fish. All these efforts can be found under this 'box jelly fish' label. 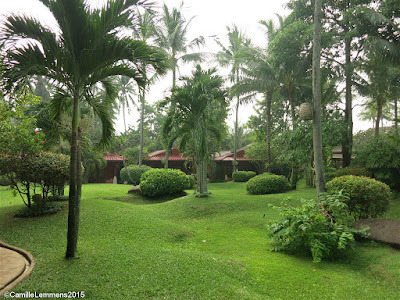 Our stay at Zazen boutique resort & spa last weekend was a highlight for our family and we enjoyed every moment of that. Restaurant reviews of Artizen tables & deli and Nadimos, Lebanese restaurant were also posted this month. Still an enjoyable month for me, since I got to spend it at home, with my family. Later today I'm off to Surat Thani, where I'm planning to run a half marathon tomorrow morning, after which I will drive to Khao Lak to start a PADI IDC there on Monday. Thanks for visiting my blog this month and I look forward being able to welcome you next month, November 2015! The forecast is actually looking fairly good for this time of the year. The next ten days promise a mixed bag of cloudy and sunny moments but every day may have one or more showers. The forecast has changed, for the better! A lot less clouds are predicted for the next ten days with possibly a lot more sunshine to come but still the possibility each day of having showers. 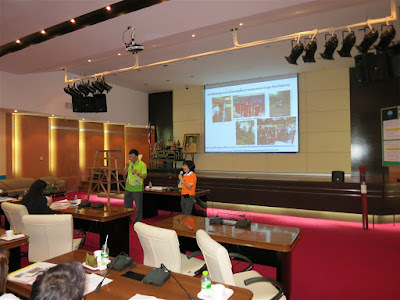 Yesterday saw me conduct a box jelly fish awareness and prevention presentation at Zazen Boutique Resort & Spa in Bophud. It was the same presentation that I already conducted last week at various other locations around Koh Samui. This presentation saw staff from various departments of Zazen Boutique Resort & Spa attend the presentation. From beach boys to management staff, almost all departments were represented. 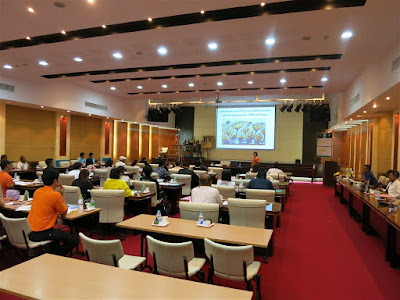 With 25 participants, the presentation was well attended and once more, I had a captive audience who were interested and interacted well during the presentation with some good questions and observations and they walked away with new acquired knowledge and know how in the field of box jelly fish history in the Samui archipelago and Thailand, how to deal with box jelly fish incidents including the importance and function of using vinegar (that it doesn’t take the pain away but that vinegar stops more stinging cells from firing off their venom, it neutralizes the nematocysts) and we also discussed box jelly fish prevention methods. In total 25 staff of Zazen Boutique Resort & Spa attended the presentation. After the initial presentation, 12 staff members continued with additional CPR training. 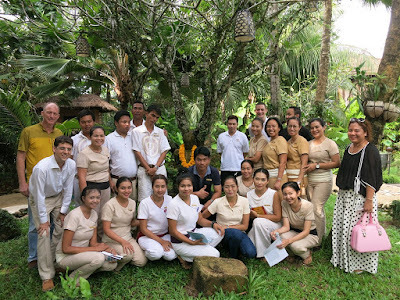 It will be no surprise that various beach boys participated in this additional training, but also restaurant staff, spa staff and house cleaning staff participated. 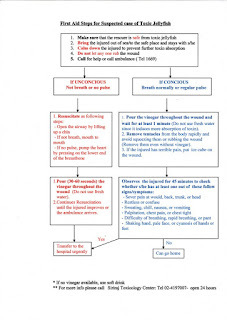 The correct procedures for administering CPR and ventilations were introduced, explained and demonstrated to all participants and each attendee was given the opportunity to practice until they had it right. For some that was immediately and others needed a few extra chances to get it right. In the end everybody managed to get the job done though and thus ended a busy and interesting day. In the morning I attended a box jelly fish training presentation in Nathon, organized by the ‘Tessabaan (Koh Samui municipality) and the afternoon saw me conducting a Box jelly fish awareness and prevention presentation at Zazen Boutique Resort & Spa in Bophud. Thanks to Zazen Boutique Resort & Spa for giving me the opportunity to conduct this training, it seemed that the staff enjoyed the training and walked away with new and important knowledge and hopefully they will now know how to deal with a box jelly fish incident. 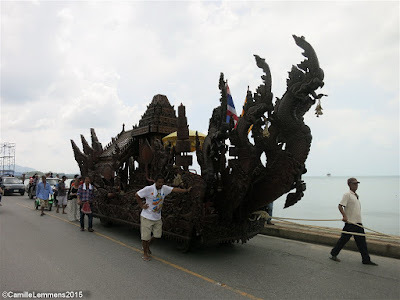 The boat from Wat Kiriwongkaram in Baan Taling Ngaam that is part of the Rua Chak Phra festival, this is the only boat that still needs to be pulled by hand power, it's not motorized and made of hard wood. It's a beauty! Yesterday plenty of boats were all over the island, causing a traffic jam or two. The forecast hasn't changed that much, tomorrow and Saturday may see some sunshine, but back to cloudier skies after that. Expect rain during all days, in various quantities. The rainy season has started. Today saw another day of Box jelly fish training at the Tessabaan in Nathon, day 2. 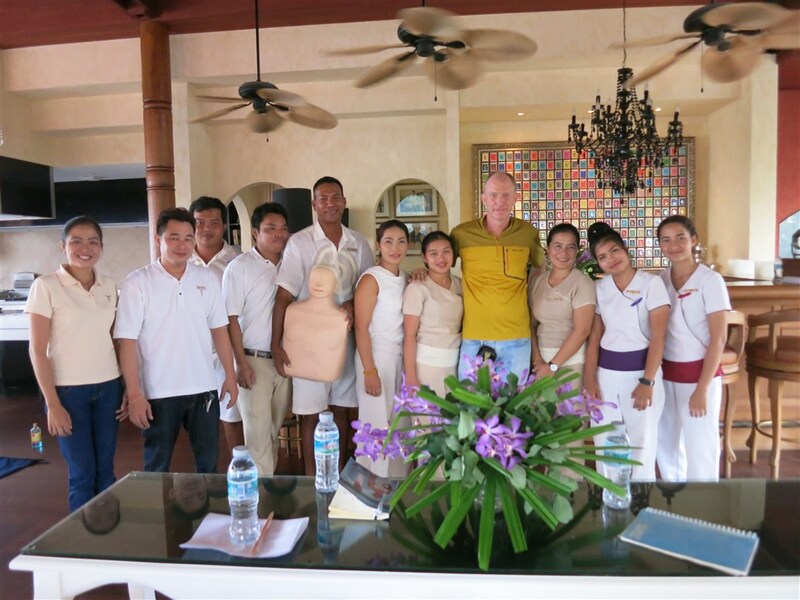 After yesterday's training to medical staff from around the island, including doctors, nurses and Rescue staff at the 'Tessabaan' or the Koh Samui Municipality, this was day and round 2! 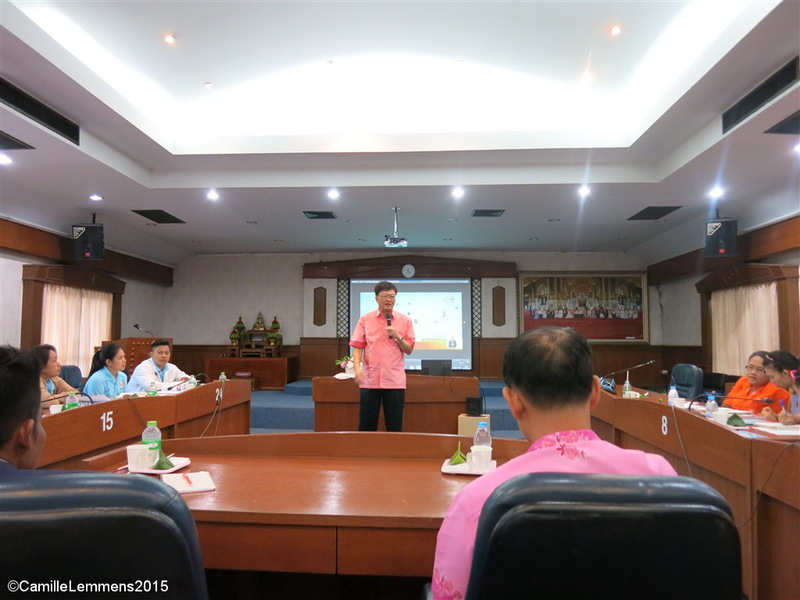 The two days of training were initiated, organized and sponsored by the Tessabaan. Dr Lakkana, one of the two Thai box jelly fish experts, was invited to attend various meetings to discuss and improve effective box jelly fish measures around the island and to conduct the training presentations. Besides being one of Thailand's box jelly fish experts, she is also a member of a Thai Box jelly fish work group from the Thai Bureau of Epidemiology. The members of the Box jelly fish work group have visited Koh Samui various times already, the first time, 5 years ago, earlier this year in August and earlier this month. Whenever possible I try to meet up with the work group when they visit Koh Samui, to exchange ideas and learn new things. Dr Lakkana was also on Koh Samui last year as a guest of the THA (Thai Hotel Association) chapter Koh Samui, and conducted box jelly fish training for hotel staff around the island and the THA is trying to have Dr Lakkana back in January 2016 for more hotel staff training. Today's box jelly fish training at the Tessabaan in Nathon, day 2 was a general presentation about box jelly fish and Portuguese man-of-war, that covered many aspects, like the way the nematocysts or stingers of the box jelly fish work, pictures and descriptions of many real life box jelly fish incidents and prevention ideas and modules at other locations in Thailand and how to deal with box jelly fish stings. 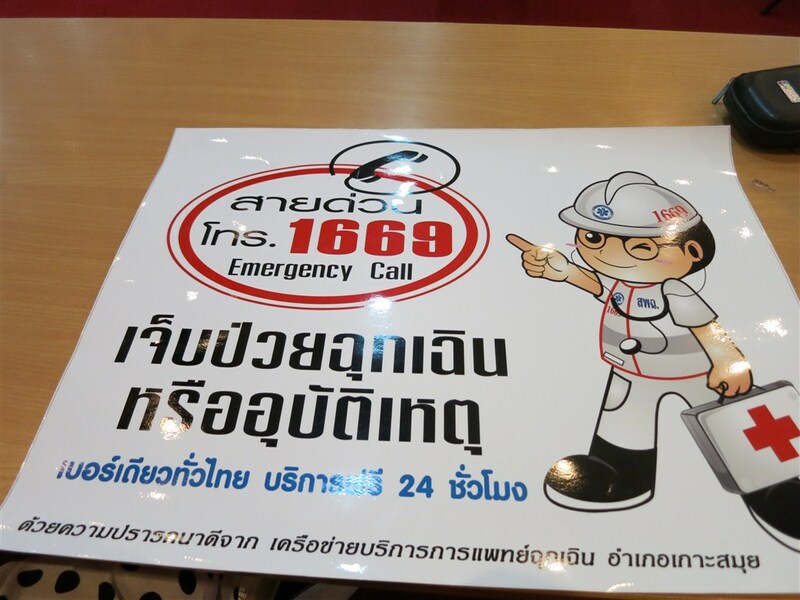 Today also saw the introduction of a life beach guard system, that needs to be set up around Koh Samui's beaches. Khun Chanchai Janworachaikul MD, Director of Koh Samui Hospital is a strong believer in such a system and spend a good amount of time explaining the benefits of having life guards on the beaches around the island. Life guard chairs, vinegar first aid poles and educational warning signs will be installed at Lamai beach (with life guard on duty). If this works, this model will be expanded to other beaches on the island. There will also be a final uniform color design, a unique design and this will be standardized. Today's box jelly fish training at the Tessabaan in Nathon, day 2 saw a lot of Lamai hotel manager/owners, HR association, life guards and jet ski staff attend. There were about 50 attendees. My wife and myself attended both events that were conducted at the Tessabaan by Dr Lakkana. We had to leave around noon because I had to conduct a box jelly fish awareness presentation at Zazen Boutique Resort & Spa in Bophud during the afternoon. 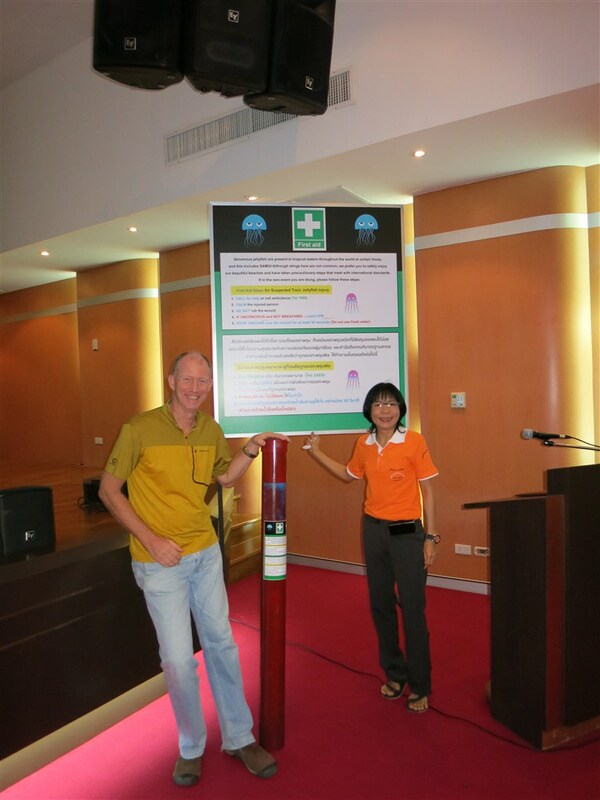 As you can see, a lot of initiatives are being taken and progress in the field of awareness, prevention and training has been made with many different layers of people on Koh Samui that work around Koh Samui beaches or may become involved with victims of box jelly fish stings. A very productive couple of days indeed, with thanks to the Tessabaan and Dr Lakkana and all people involved to make this happen. The forecast predicts clouds until Friday afternoon, after which we may experience some sunshine, by Monday the clouds should be back again but rain in various strengths can be expected every day for the next ten days. The Rua Chak Phra Festival 4-12 November in Nathon is one of the events you don't want to miss if you're on Koh Samui during that week. 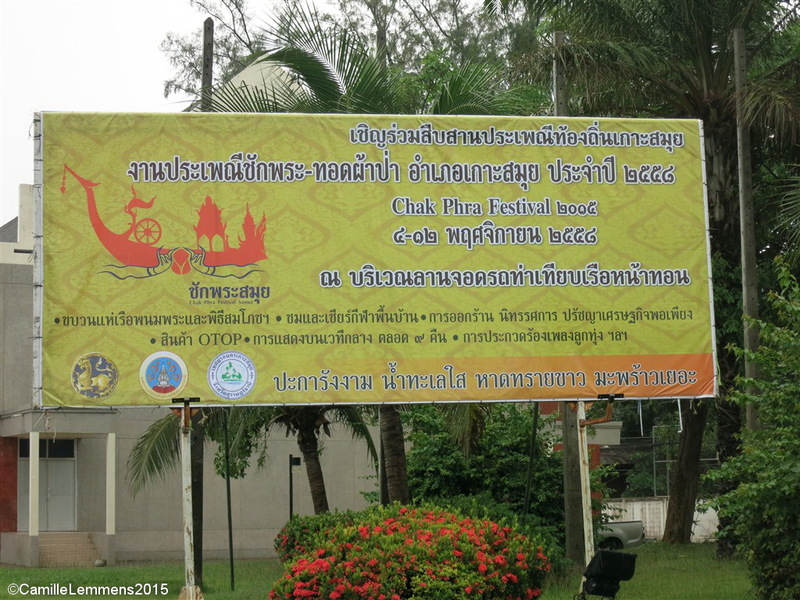 It's a very interesting event with loads of Rua Chak Phra's on display in Nathon. To get an idea what this is all about, check out this link from last year's event. The floats look fantastic, very colorful and some are real pieces of art! There's one completely made out of hard wood and this one can still be pulled by man power, very impressive. Don't be upset of all of a sudden there's a bit of a traffic jam in your hood, it may well be a Rua Chak Phra being shown off. In the week from 4 to 12 November, all boats or floats will be gathered in Nathon and are on display, a great moment to witness some local folklore and an absolute fantastic opportunity to make some amazing pictures. You have been warned, now don't miss out on this! 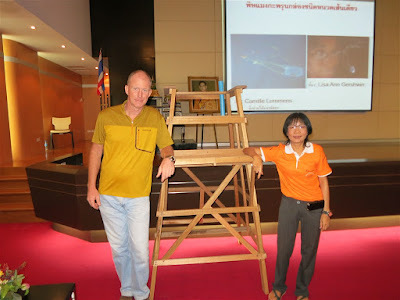 Today there was a 'Box jelly fish instructor trainer presentation on Koh Samui', conducted by Dr, Lakkana Thaikruea, one of the leading box jelly fish experts in Thailand, and member of the Thai Box jelly fish work group with whom I've met a few times already, starting 5 years ago. Tomorrow there will also be an all day long training schedule for life guards around Koh Samui beaches. Both days are being organized by the Tessabaan or the Koh Samui municipality and the meetings are taking place at the Tessabaan buildings in Nathon. Today's presentation was aimed at doctors, nurses and ambulance staff from the various hospitals around the island and for Rescue workers. With Dr. Lakkana's charming and informative presentation style, she had a captive and interested audience and many notes were made and questions asked by the audience and answered by her. Khun Chanchai Janworachaikul MD, Director of Koh Samui Hospital was also among the attendees and he spoke as a speaker about tomorrow's meeting, which is an initiative of him, a life guard that will be called into life, to guard the beaches around Koh Samui.A very good and long overdue initiative indeed! 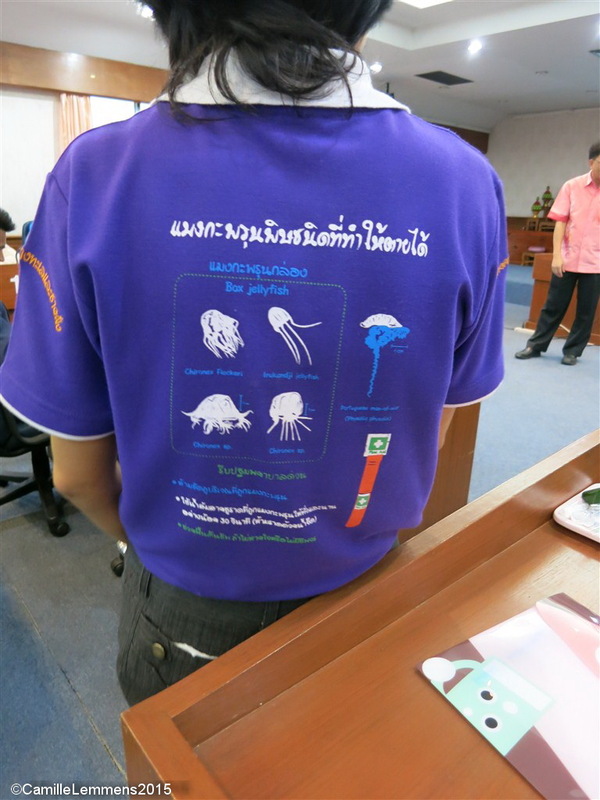 These are just one of the initiatives that are happening around Koh Samui at the moment and shows that the box jelly fish threat is taken seriously. Once all planned activities and plans have been executed, I can only hope they will remain in place, active and on a regular base reviewed and upgraded when needed. The THA (Thai Hotel Association) chapter Samui is still planning to have Dr. Lakkana back in January for further hotel staff training and a meeting with General Managers of hotels on the island and I keep my presentations going steady, with another one scheduled for tomorrow afternoon at Zazen Boutique Resort & Spa in Bophud. A good start seems at least to have been made! The forecast is looking like what you may expect during the rainy season, plenty of cloud cover, with some easing up between Friday and Monday but during all days you can expect rain in various degrees of strength. The rainy season seems to be here,a s already mentioned in my opening phrase of this post! It's our last morning of our stay at Zazen Boutique Resort & Spa and we had and still are having a fab time. In a moment we're off to enjoy the great breakfast buffet. Have read here about our stay, with another update to come later today. The forecast predicts heavy cloud cover until Thursday along with some fairly heavy rain at times, specifically Thursday. From Friday onward the clouds may ease off but the rain won't. The rainy season is knocking on the Koh Samui door. 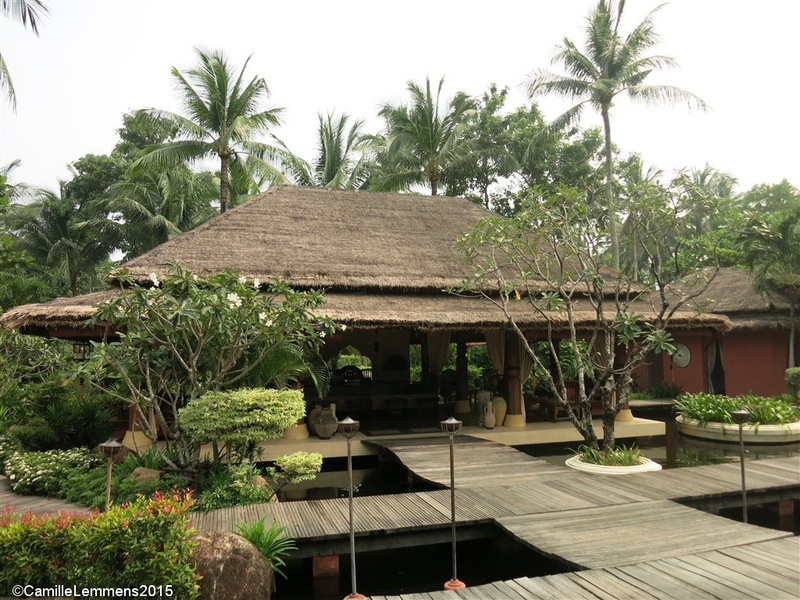 This weekend we are enjoying a sat at Zazen Boutique Resort & Spa in Bophud. It's not our first visit here, here you can read a review of a visit to their restaurant back in 2007, one of my very first reviews on this blog, during one of the very first months since I started the blog. We have been back a few times and enjoyed the restaurant, but we never stayed here before. Now, Alexander and Ti, the owners and managing directors, were so kind to invite us for this weekend's stay. As it happened to be, last week my wife and me also celebrated our 13th wedding anniversary, so the invitation couldn't have come at a better time. Immediately upon arriving you feel at ease and are taken care of by the very friendly staff at reception. There are two separate lounges where you can wait for all the check in procedures to be taken care. A welcoming drink is offered and everything went very smoothly and before you know it, the friendly staff (did I mention this already?) shows you the way to your room, with the suitcases following within moments and you get a tour of the resort and the restaurant. Very efficient and very friendly. There we were in our Garden Villa, a 65 square meters big villa, with two extra beds for the children an a baby cot for our two year old baby girl. Today we had the baby cot taken out, since our baby girl sleeps with us in our big bed. 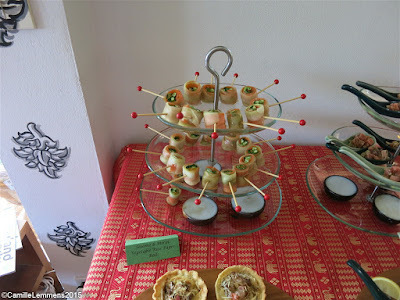 This is in typical Thai style and it makes you wonder how we managed ending up with 3 children. Although, that's a different story. 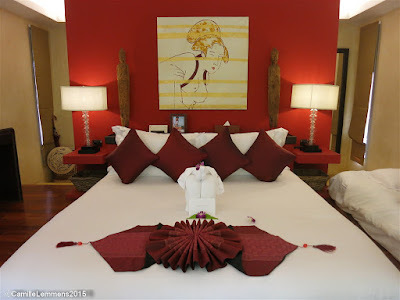 Our Garden Villa is lovely, the picture shows the big king size bed with lots of pillows to chill out. There's a very inviting and relaxing Moroccan Lounge with a large day bed (which now was turned into a bed for one of our older children), making you slow down and enjoy your stay at this Boutique Resort. The Zazen Boutique Resort & Spa in Bophud is truly Boutique! This can be found back in many different ways and loads of small details that make your stay here extra memorable and enjoyable. How about a silk dressing gown with silk indoor slippers in the room and there's a also a chess game for you in the room and I'm writing this review with the help of the very fast wifi throughout the resort and this all comes besides the usual amenities you would expect, like a very well stocked fridge, a 32" flat screen TV with 30 channels, an electricity adapter, hair dryer, safe, a private balcony with sun-beds and table, an open-air outdoor Balinese bathroom with hot tropical rain and hand showers and lots more. 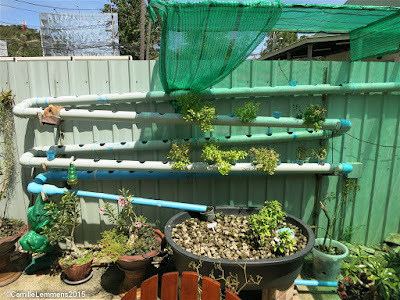 The only thing that we miss in our rooms, is the bidet sprayer or shower in the bathrooms, a very typical Thai institution when it comes down to bathroom utilities. 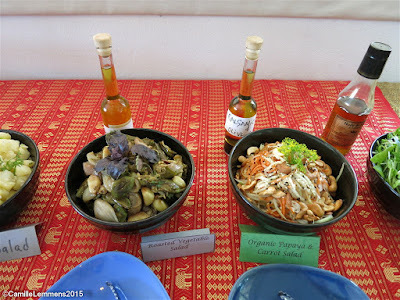 We're so used to this as a Thai family and we find it surprising that they're not available. 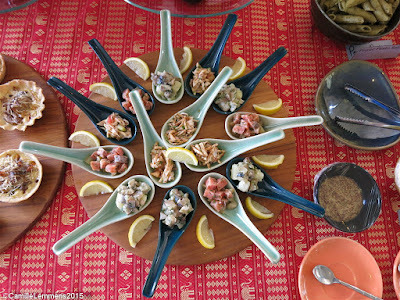 Western visitors to the resort probably would not miss this utensil at all, unless they lived for prolonged times in South East Asia. It's however a minor inconvenience which we will surely and easily survive! It's all there and presented with an eye for detail and to really make your stay memorable and enjoyable and so far we're having a great time. Besides the Garden Villa's there are also 5 Beachfront Deluxe Bungalows and 10 Garden Deluxe Bungalows. As I said before, with only a 25 luxury Villa's and Bungalows, it's indeed 'Boutique' and a quiet getaway. Near the beach you can find the 'heart' of the resort, the restaurant area, with upstairs 'Le Salon de Ti' for an afternoon high tea or to enjoy the Dilmah Tea Bar with a choice of 23 hand-picked fine tea varieties but also a whole new range of amazing tea-based cocktails. Dilmah is a world renowned tea brand from Sri Lanka. 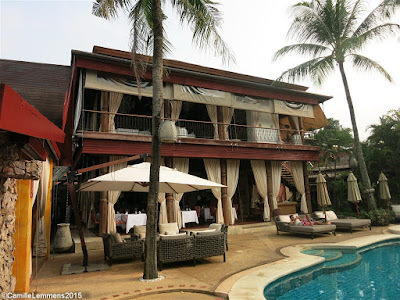 Zazen Restaurant is famous throughout Samui island for its deep, romantic atmosphere and delectable East Meets West cuisine from master chef, Matthias. A dinner review will follow soon. In this area you can also find the 'Rouge Lounge & Bar' with a view over the ocean and the beach for pre and post dinner drinks with a huge selection of 30 wines by the glass and an extensive wine list numbering over three hundred wines, on display in a freshly created glass cellar and cocktails from a range including exclusive surprises and many specialties. The Wine cellar of Zazen Boutique Resort & Spa in Bophud is located under ground with the ceiling fo the cellar made out of glass, which gives you the opportunity to look into the cellar from above. The cellar holds 900 bottles of wine with another 200 bottles of white wine and rosés being kept in fridges. For more interesting facts about wine tastings, their range of corkscrews, the wine list and more, please follow this link. If you're a cigar aficionado. there's also a humidor which offers one of the biggest selections of cigars on the island with over 60 different cigars ranging from Cubans over Dominicans to Honduran fine quality cigars, well stored and taken care of. Thai cooking classes can also be followed here and are a lot of fun with a very practical learning curve! Something that also caught our eye, is another small detail that makes a stay here so enjoyable is the grooming and friendliness of the staff. All the female staff was absolutely taken with our 2 year old daughter, which was a pleasure to experience. Alex and Ti also invited us to a Thai massage in their 'Le Spa Zen' and I love a good Thai massage and the masseuses at 'La Spa Zen' definitely know how to to give you a proper and relaxing Thai massage. You have the choice of eleven different traditional massages and treatments, five different body scrubs, four different body wraps, four different facials and eight different hand and foot care treatments. This alone can keep you busy for the duration of your stay. Before the massage you are asked to fill out a short questionnaire that will help the masseuses to give you a massage or treatment the way you like and prefer it, light, medium or strong but it also inquires about any special preferences or body parts that need extra attention. Our massage was excellent and an hour flew by, it could have gone on for another hour at least! Right now, once this post has been completed, me and my wife are actually off for another Thai massage and one more hour of pure relaxation. 'Le Spa Zen' is a very important part of the resort and it's concept and once here, you better not miss out on one of their treatments! Check out the menu here. We had dinner last night at the restaurant and it was delicious. A write up will follow soon and this morning we were back in the restaurant for breakfast. Still full from yesterday's dinner, it was hard to choose from all the inviting breakfast offerings. The Zazen breakfast buffet ranks easily among my top breakfasts I had the privilege of enjoying so far. As already mentioned before, more eye for detail and small surprises make me already look forward to tomorrow morning. How about dried dates, figs, cranberries and apricots, walnuts, almonds and pumpkin and sunflower seeds, home made rye bread, sparkling wine, a wide range of eggs in almost any style you wish, Asian food options, Belgian waffles, Parma ham and Emmental cheese and yogurt with various different cereals, home made jams. The list goes on. Simply delicious and very enjoyable and tasty. As you can see, we're having a very hard time indeed! It's time to get ready for another Thai massage treatment. It's a dirty job but somebody's gotta do it and I am volunteering for this one! By far Zazen Boutique Resort & Spa in Bophud is the best family-run boutique resort on the island and we can highly and warmly recommend it. Later this morning and during the rest of the day I do expect plenty of rain. The forecast for the net ten days from today through to Thursday, plenty of clouds, the wind picks up and also plenty of rain is in the sky waiting for us. However, come Friday, the cloud cover is about to ease up although there still may be showers over the island. It looks like the early days of the rainy season have arrived. Later today we're off for a two day weekend stay at Zazen Boutique Resort & Spa in Bophud for a nice staycation, so expect some updates from there. The forecast predicts more wind and rain with cloudy skies until net Friday. Over next weekend it may clear up and we may have sunnier skies. It looks like the first signs of the rainy season have arrived though. Earlier this week I had dinner with a friend at Nadimos, Lebanese restaurant in Bang Rak. Recently they moved location, they can now be found at their new location inside the Petcherat pier. For my previous review, please look here. It was my first visit after they changed location and for my friend it was an introduction to the Lebanese kitchen. I've been a fan of Lebanese food since the late eighties, when I discovered this food in West Berlin, where I lived at the time being. It has been very hard to find good Lebanese food on the island and some places opened and closed again, but it looks like Nadimos is here to stay and they offer real genuine Lebanese food. We ordered a mixed starter, the above pictures cold mezze mixed platter and a mixed BBQ mixed platter, pictured below. 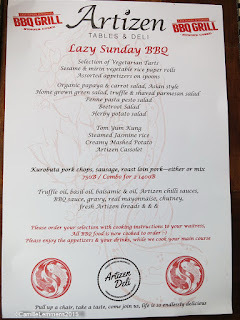 The food was good and I really enjoyed the various cold mezze's and the BBQ platter. In all fairness, my friend wasn't as taken away by the foo as I was. I guess he needs some practice! Mixed BBQ platter with 2 lamb skewers, very tender chicken and lamb sausages. 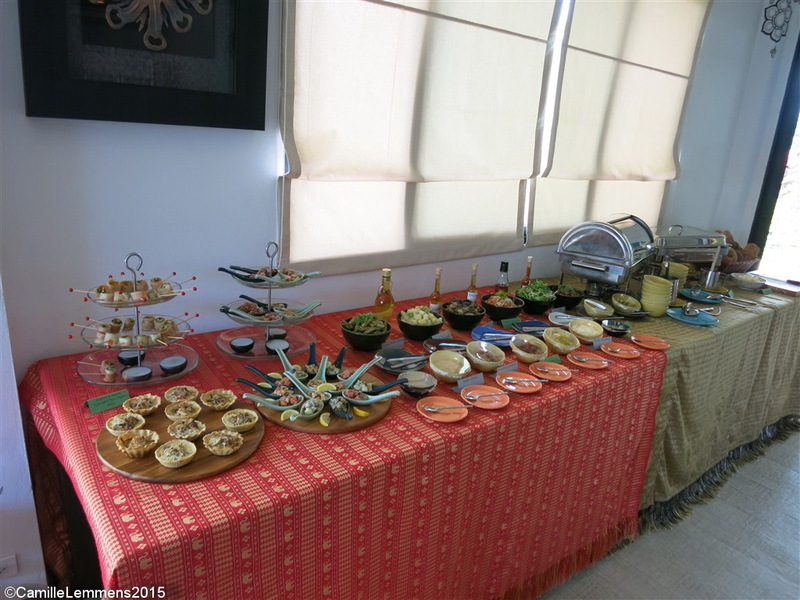 All the food is halal prepared and there are lots of vegetarian options available. I can recommend a visit to Nadimos, although it was a bit pricey in our opinion, the total bill came to 1,500.-THB without alcohol. There are resident discount cards available which entitle you to 10% discount on consecutive visits. Check out their Facebook page or their website, that includes their three Bangkok outlets as well, where Nadimos' story started. Today is a public holiday in Thailand, in honor of Chulalongkorn Day. The forecast predicts until early tomorrow morning and the remainder of the weekend might be sunny but from Monday onward a mix of cloudy skies, a few bright and sunny moments and plenty of showers might sweep over Koh Samui, seemingly a prelude to the rainy season. 23 October of every year is a national holiday in Thailand as it marks “King Chulalongkorn Day" or known in Thai as "Wan Piyamaharaj Day". 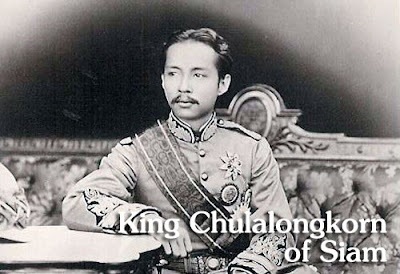 It is the memorial day of the passing away of King Chulalongkorn, otherwise known as King Rama V. King Chulalongkorn led several major reforms in Thailand, for example in the areas of Thai educational system, military affairs, State Railway and Slave Liberation Act without bloodshed in Thailand. A real good description of who King Chulalongkorn or Rama V was, can be found at the website of the Thai Embassy in Singapore, here. During this official Thai holiday, all official institutions like banks, government buildings and offices, schools and so on will be closed. This is the cleaning of Chaweng lake, as reported a few days ago. 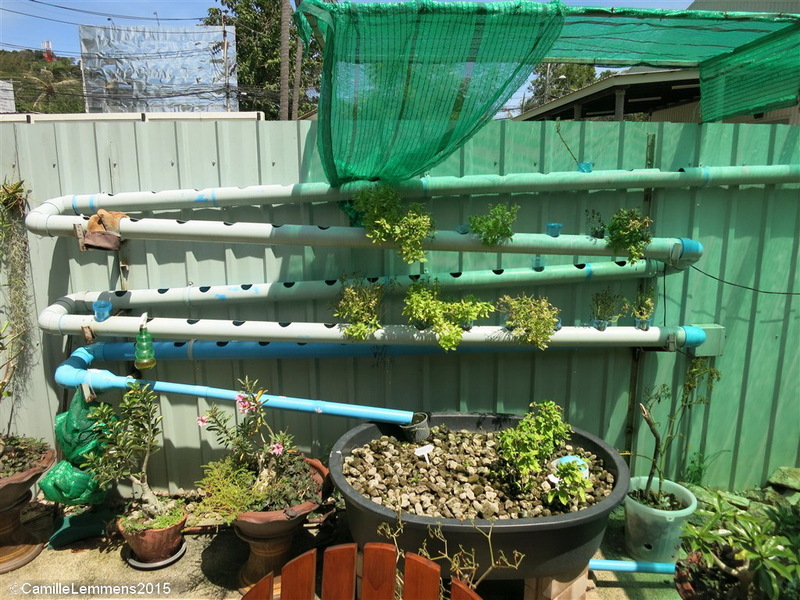 There's so many plants that it took a few days extra to clean all the plants in front of the klongs. The forecast predicts a decrease in cloudy skies each day until Saturday and from Sunday onward we may experience clouds and rain until the end of the month. 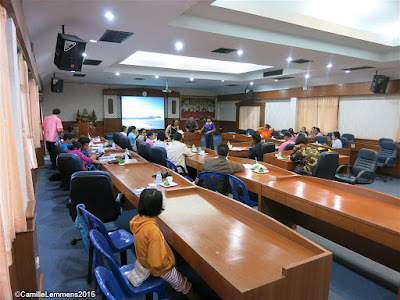 Today I gave two box jelly fish awareness and prevention presentation at Miskawaan in Maenam, one in the morning to a group of twelve persons and one in the afternoon to a group of twelve persons. All 24 participants at the box jelly fish awareness and prevention presentation at Miskawaan in Maenam work at Miskawaan. This is a private villa rental group with 11 villas for rent. Check their website out here. Ans it's not done yet, this evening I will conduct one more presentation for Koh Samui's dive community and it looks like this may see another twenty or more people attend. Kore to follow on this later. Both presentations consisted of a power point presentation covering the history of box jelly fish in Thailand and specifically the Samui archipelago. Both groups were very inquisitive, interested and interactive. A treat for me, the presenter! A lot of information was given and gladly received. A lot of misconception was cleared and a lot of questions were answered. After the presentations, we practiced CPR on two mannequins that I brought along and it was very useful practice and for most participants the first exposure to CPR training. Besides copious amounts of vinegar being used on box jelly fish wounds, CPR can be a life saver with a box jelly fish in injury, since you can have a cardiac arrest due to the venom. Both groups also had lots of fun during this practice and we repeated each skill until everybody did it correctly, including 30 compressions and 2 ventilations. Congratulations to Miskawaan for taking the time out for their staff to have this important training. 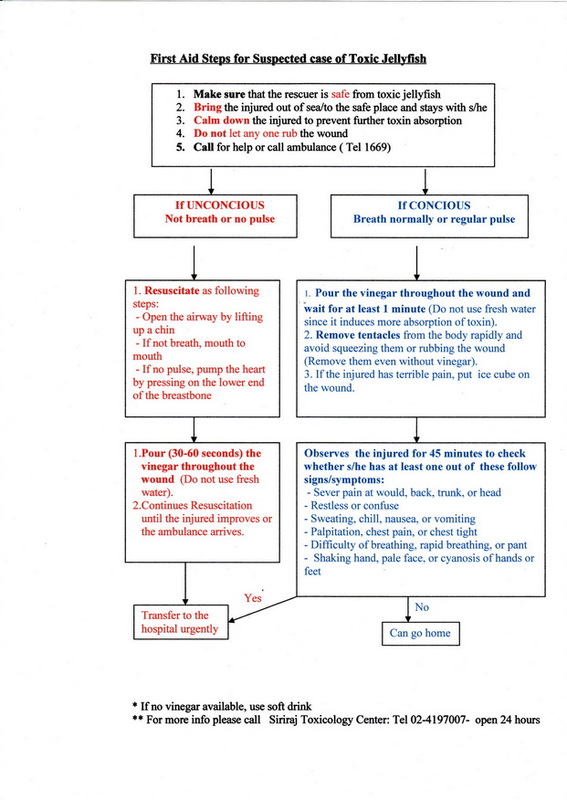 A good initiative and as a result your staff is now trained to help with and when box jelly fish related accidents occur. After the sad and unfortunate death of a 20 year old German tourist due to box jelly fish injuries on Lamai beach, there's a lot happening on Koh Samui behind the scenes to prevent box jelly fish incidents, raise awareness about box jelly fish and train people on how to deal with box jelly fish incidents and injuries, including presentations by myself. If you're interested to have a similar presentation for your company, hotel or resort, please get in touch with me for more information. Since over 10 years I'm active on Koh Samui, trying to raise awareness about box jelly fish, in cooperation with Thai experts from the Thai Bureau of Epidemiology. 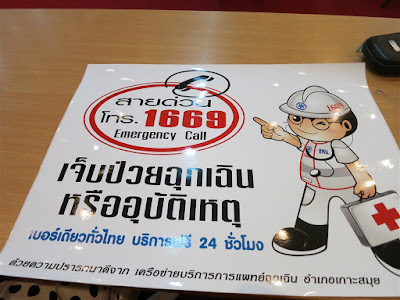 These signs can be found along many roads around Koh Samui. The signs state say that on 5th December, HM King Bhumibol's birthday, there will be yellow plants all over the island, in honor to HM King Bhumibol. The forecast predicts a mix with partially cloudy skies and sunshine until Sunday, from Monday onward we may expect cloudy skies and plenty of rain. It looks like the rainy season or monsoon is coming down on us towards the end of this month. A shortcut road at the Northern end of the Samui airport landing or take-off strip in Bang Rak, This dirt road finds it way around the landing strip. At each side there are barriers, that are manned by airport staff and the barriers are closed when an airplane takes off or lands. The forecast eased up a bit until Monday, fairly sunny skies with an occasional shower and next Monday we can expect heavier cloud formations with more chance of showers. Chaweng viewpoint, these are the only two spirit statues left, they are the original statues. A lot of people brought their broken spirit statues or new statues to this locations in order to commemorate relatives who were killed in road accidents or in other ways in that (general) area or on that exact spot. It's very noisy there, since most Thais passing on their bikes or in their cars will honk their horn a few times Now it's all cleaned up and no other statues can be found here. I wonder if they keep it cleaned up like this or if new statues will 'creep' in again over time. You can find places like this all over the island and Thailand. The forecast predicts mostly cloudy skies with a break between Thursday and Saturday. Outside of these three days, you can occasionally expect tropical showers and/or thunderstorms. 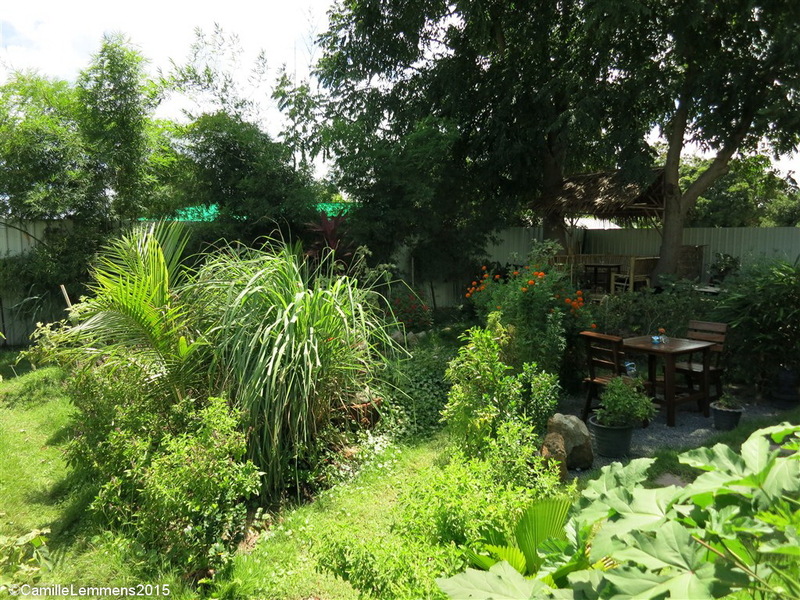 Recently we visited Artizen, tables & deli, located in the greater Bang Rak area, near the arrivals area of Samui airport. It's Chef Jonny's baby and he created a lovely place where you can get good, mostly organic food in a nice and relaxed atmosphere. 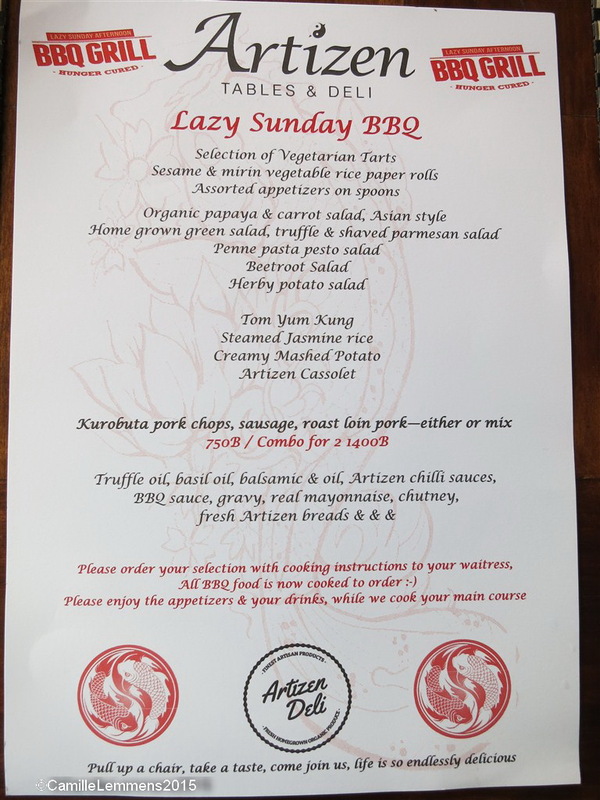 We visited Artizen, tables & deli the last Sunday of the month and without knowing it, we were in for a 'Lazy Sunday BBQ'. We made a reservation the day before, but unfortunately the Thai staff didn't alert us to this fact. 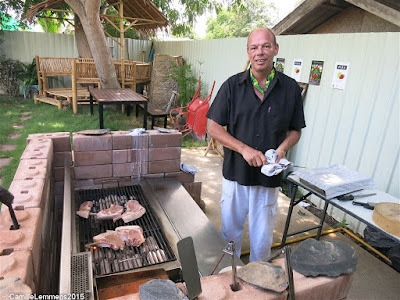 We decided to stay and enjoy the BBQ and we didn't regret it, but it's something you may want to check out, if it's alone for the price difference with the regular menu. The restaurant area at Artizen, tables & deli is rather big, with an inside and outside area, with the latter being really nice on sunny days and it gives you a good view on the garden, where a lot veggies are cultivated and grown that are used in the food that you order. 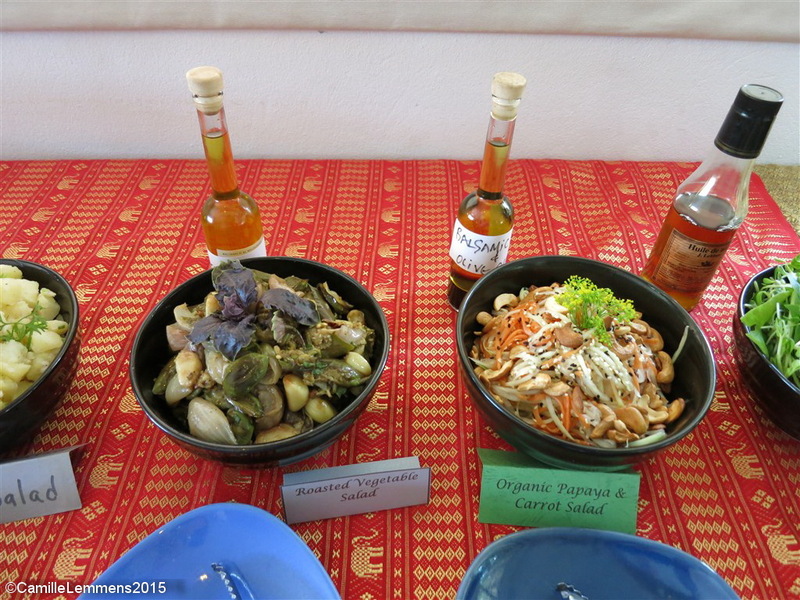 The selection of food that was offered was good, with plenty of choice, including various salads, the rice paper rolls pictured above, a Tom Yam soup, mashed potatoes and more. 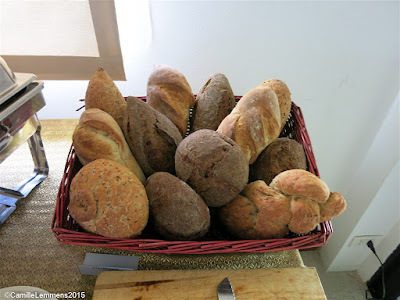 There was also some excellent fresh bread and plenty of oils and sauces to choose from; truffle oil, basil oil, balsamic vinegar, chilli sauces, chutney and a few more. As part of the BBQ you also get to choose from Kurabuta pork chops, sausage and /or pork loins or you can have a mi of these selections. The meat was really good and barbecued on the spot by Jonny. He has at least three different sausages and they're really good, I can recommend his Indian sausages. We had a nice afternoon, with good food but it was a lot of food as well, another thing you may want to consider if you visit the last Sunday of the month. 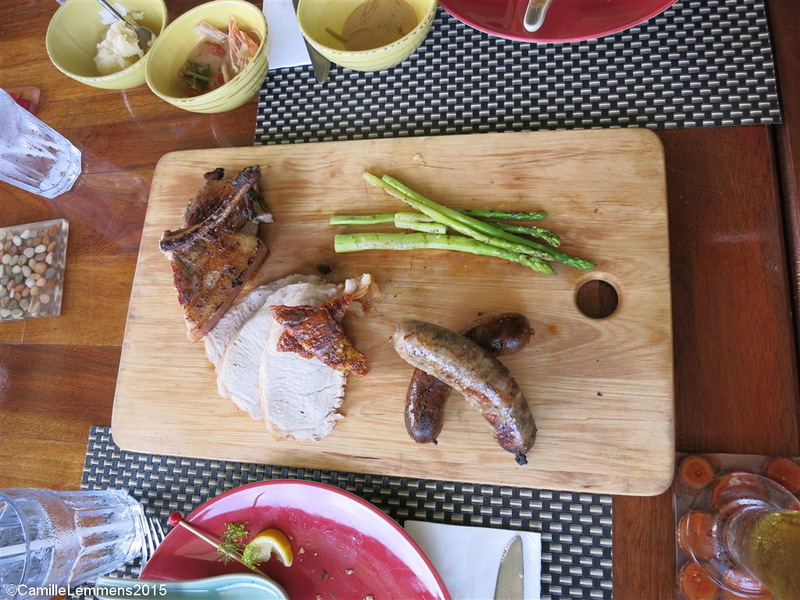 Especially for us non English, a Sunday roast style BBQ can be a bit overwhelming. It will be interesting to go back and try the standard menu, this carries also a few interesting items that I would love to try. There will be a link to Artizen's website at the end of this post, where you can find a link to the menu as well. Artizen was also represented at the recent Samui green market, where they were selling deli products, another reason to check out Artizen and pick up some good deli products. Hope you enjoy your meals here!